I arrived at the Hannover airport on Wednesday Sept. 25th at about 10:30, a short one hour flight from Paris on a Lufthansa Boeing 737. A couple months earlier, after making plans for a vacation in the Alps, I sent some email to Jens Kolpack about a possible stop in Hannover on my way home. He said that he was getting married during that time and invited me to his wedding. My first response was one of reluctance since I didn't want to be a burden during such a time. But Jens' response was "It is the time to meet Kolpacks." So I gratefully accepted the invitation. As I cleared the gate, I saw this blonde haired guy holding a sign that read "KOLPACK." My first impression was that this guy can't be a Kolpack; he's over 6 feet tall! But it was Jens Kolpack, a typical 29 year old German wearing blue jeans, a sweatshirt, and a black leather jacket. We exchanged a few pleasantries and headed off to the parking garage. Luckily for me, Jens speaks perfect English since my German leaves much to be desired. We went to his apartment where I met his bride-to-be Minerva. She is a wonderful person who immediately made me feel at home and one of the family. She has beautiful dark eyes which she inherited from her Turkish father, and an unbounded sense of humor. That afternoon, Jens and Minerva hosted an afternoon get-together for their parents. Minerva's parents has recently flown in from Ankara, Turkey, and Jens' parents Hans-Jürgen and Gisela were stopping by Hannover on their way home from a vacation in Italy. 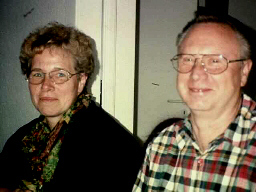 It was the first meeting of the parents of Jens and Minerva. The Kolpacks pulled up in their camper. Before they left, we all got a tour of the camper and it reminded me of the camping trips my family used to take when I was young. My Mom would love this little camper. That afternoon, I showed off pictures, maps, and talked (as best I could with poor German and Jens' translations) about how I fit into the Kolpack clan. Hans-Jürgen , in typical Kolpack fashion, did not have a lot to say, and he looked a lot like my Uncle Earl. Wednesday night I went to a local brauhaus (brew pub) with Jens where a bunch of his co-workers were celebrating. Jens is a policeman with the Hannover Police. The guys I met were all fairly young, very personable, and seemed to be liberal-minded by American standards. Half of them, including Jens, wore an earring. I made friends with Jens (a different Jens), Niels, Olaf, and Oliver, all of whom spoke excellent English. Niels collects patches from Police Departments from around the world, so I told him that I would try get him one from Seattle and one from Fargo. Jens gave me Hannover Police patches for trade. Thursday, we slept in late (it was a late night). In the afternoon, I accompanied Jens on a shopping trip for the Friday festivities, and we stopped by the Hannover Police Dept. for a short time. Jens works in the Robbery and Burglary division. He says that the biggest problem in Hannover is with junkies. Thursday night was spent making last minute preparations for the big day. However, there was some spare time Wednesday and Thursday for some Kolpack family research. Jens had purchased a CD-ROM of German names, addresses, and phone numbers. We found about 50 Kolpack listings. They appeared to be concentrated in three areas: Lower Saxony (Jens' family), the Ruhr, and Berlin. Most had no information, but those that did said they were also from West Prussia. Jens got some interesting information talking to the 76 year old wife of a Wilhelm Kolpack. She said that there were some Kolpacks who moved from West Prussia to East Prussia (Königsberg area) to work in some mines, and then moved to the Ruhr after WWI.